A common way of introducing fmap is saying that it only changes the values in a container, and not its structure. Leaving behind the the functors-as-containers metaphor, we can convey the same idea by saying that fmap leaves the context of the values in a Functor unchanged. But what, exactly, is the “context” or “structure” being preserved? “It depends on the functor”, though correct, is not an entirely satisfactory answer. The functor laws, after all, are highly abstract, and make no mention of anything a programmer would be inclined to call “structure” (say, the skeleton of a list); and yet the preservation we alluded to follows from them. After struggling a bit with this question, I realised that the incompatibility is only apparent. This post shows how the tension can be resolved through the mediation of parametricity and naturality, two concepts from different domains that are intertwined in Haskell. A correct, if rather cruel, answer to “Why does fmap preserve structure?” would be “By definition, you silly!” To see what would be meant by that, let’s have a look at the functor laws. That functors preserve category structure is evident. However, our question is not directly about “structure” in the mathematical sense, but with the looser acception it has in programmer parlance. In what follows, our goal will be clarifying this casual meaning. What Can You Do With a Function? As an intial, fuzzy characterisation, we can say that, given a functorial value, the Functor context is everything in it other than the wrapped values. Starting from that, a straightforward way of showing why fmap preserves context involves parametric polymorphism; more specifically, the preservation is ensured by the wild generality of the types in the signature of fmap. We will look at fmap as a function of one argument which converts a plain a -> b function into a function which operates on functorial values. The key fact is that there is very little we can do with the a -> b function when defining fmap. Composition is not an option, as choosing a function other than id to compose it with would require knowledge about the a and b types. The only thing that can be done is applying the function to any a values we can retrieve from the t a functorial value. Since the context of a t a value, whatever it is, does not include the a values, it follows that changes to the context cannot depend on the a -> b function. Given that fmap takes no other arguments, any changes in the context must happen for any a -> b arguments uniformly. The first functor law, however, says that fmap id = id, and so there is one argument, id, which leads to no changes in the context. Therefore, fmap never changes the context. The informal argument above can be made precise through a proper type theory treatment of parametricity. Philip Wadler’s Theorems for free! is a well-known example of such work. However, a type theory approach, while entirely appropriate, would have us taking concrete Haksell types for granted and only incidentally concluding they are functors; in contrast, our problem begins with functors. For that reason, we will follow a different path and look at the issue from a primarily categorical point of view. What Is a Context, After All? In the spirit of category theory, we will now focus not on the types but on the functions between them. After all, given functional purity any interesting properties of a Haskell value can be verified with suitable functions. Let’s start with a few concrete examples of how the context of a Functor can be probed with functions. -- Maybe-fmap on the left, -fmap on the right. Earlier we said that the Functor context consists of everything but the wrapped values. Our examples illustrate how parametric polymorphism makes it possible to keep that general idea while putting functions rather than values under the spotlight. The context is all that can be probed with functions fully polymorphic on the type parameter of the Functor; or, taking the abstraction further, the context is the collection of functions fully polymorphic on the type parameter of the Functor. We now have done away with the fuzziness of our preliminary, valure-centric definition. The next step is clarifying how that definition relates to fmap. -- f is arbitrary, and so are the involved functors. The equations for reverse and listToMaybe clearly have that shape. length does not seem to fit at first sight, but that can be easily solved by lifting it to a constant functor such as the one provided by Control.Applicative. -- For constant functors, fmap f = id regardless of f.
A similar trick can be done with the Identity functor to make functions in which the type parameter of the Functor appears bare, such as Just :: a -> Maybe a, fit our scheme. Naturality for Haskell Functors. Example instantation: T = ; U = Maybe; r = listToMaybe. The naturality condition matches our commuativity property. Indeed, polymorphic functions are natural transformations between Haskell Functors. The proof of this appealing result is not trivial, and requires some theoretical work, just like in the case of the closely related results about parametricity we alluded to earlier. In any case, all it takes to go from “natural transformations preserve fmap” to “fmap preserves natural transformations” is tilting our heads while looking at the diagram above! Given how we identified Functor contexts, polymorphic functions and natural transformations, we can finally give a precise answer to our question. The context consists of natural transformations between functors, and therefore fmap preserves it. Structure, in the mathematical sense, refers to some collection of interesting operations and distinguished elements. In this example, the relevant operation is function composition, which is part of the structure of the Hask category. Besides that, however, we are now able to note the uncanny resemblance between the shapes of the law, which says that it does not matter whether we compose f and g before applying fmap, and of the commutativity properties we used to characterise functorial contexts. The upshot is that by identifying context and structure of a Functor with polymorphic functions, we retain much of the spirit of the mathematical usage of structure. The interesting operations, in our case, are the polymorphic functions with which the context is probed. Perhaps it even makes sense to keep talking of structure of a Functor even after dropping the container metaphor. -- Next, some synonyms to indicate the Functors fmap leads to. By fixing t and a in the signature of fmap_t above, we get one functor on either side of the outer function arrow: ((->) a) on the left and ((->) (t a)) . t on the right. 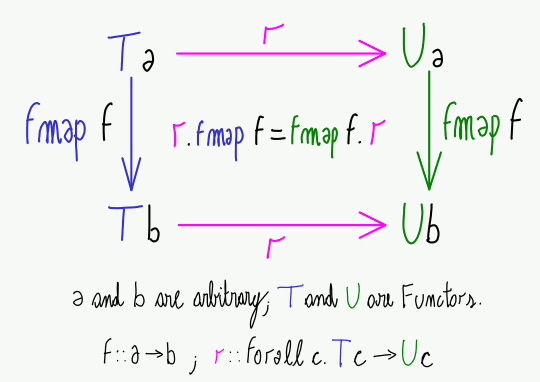 fmap is a natural transformation between these two functors. In The Holy Trinity, Robert Harper comments on the deep connection between logic, type theory and category theory that allows us to shift seamlessly between the categorical and the type theoretical perspectives, as we have done here. You Could Have Defined Natural Transformations by Dan Piponi is a very clear introduction to natural transformations in a Haskell context. We have already mentioned Philip Wadler’s Theorems for free!, which is a reasonably accessible introduction to the free theorems. Free theorems are results about functions that, thanks to parametric polymorphism, can be deduced from the type of the function alone. Given suitable generalisations, free theorems and naturality conditions provide two parallel ways of reaching the same results about Haskell functions. Free Theorems Involving Type Constructor Classes, a functional pearl by Janis Voigtländer that illustrates how free theorem generation can be generalised to types parametric on type constructors and type classes. For an explicitly categorical perspective on parametricity, a good place to start if you are willing to dig into theory is the section on parametricity in Some Aspects of Categories in Computer Science by Philip J. Scott.